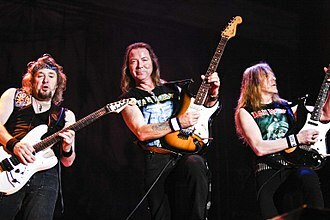 Somewhere Back in Time World Tour foi uma turnê realizada pela banda inglesa Iron Maiden em 2008, que reuniu grandes sucessos de 1980 a 1989, dos álbuns Iron Maiden (1980), The Number of the Beast (1982), Piece of Mind (1983), Powerslave (1984), Somewhere in Time (1986), Seventh Son of a Seventh Son (1988), mais "Fear of the Dark". Primeira fase: Lauren Harris, Vanishing Point, Behind Crimson Eyes, Parikrama. Segunda fase: Lauren Harris, Anthrax (apenas 30 e 31 de Maio) e Trivium (apenas 14 de Junho). Terceira fase: Lauren Harris , Within Temptation, Kamelot, Avenged Sevenfold, Made of Hate e Salamandra. Esta página foi editada pela última vez às 20h42min de 1 de agosto de 2018.